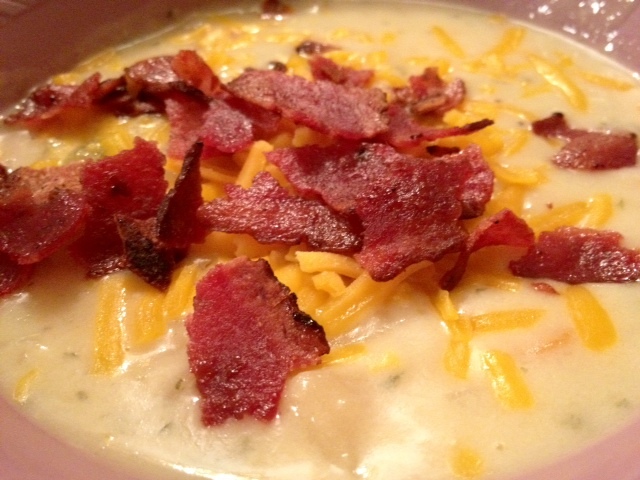 My mom’s baked potato soup is hearty and healthy and delicious and the best dang soup you’ve ever had. Even better? You make it in the crockpot, so it’s practically hassle-free. Pour the chicken stock (or water and bouillon) into the crockpot, then turn the crockpot on high (if you’re cooking for a few hours) or low (if you’re cooking for more than 5 hours). 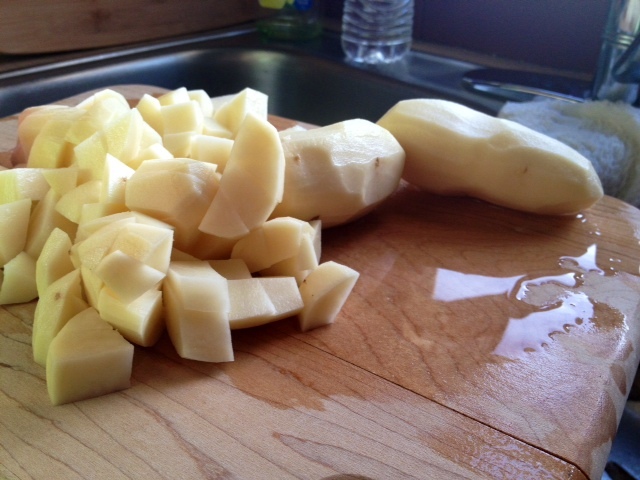 Let the vegetable chopping commence…peel and cube the potatoes (sometimes I leave the peels on). 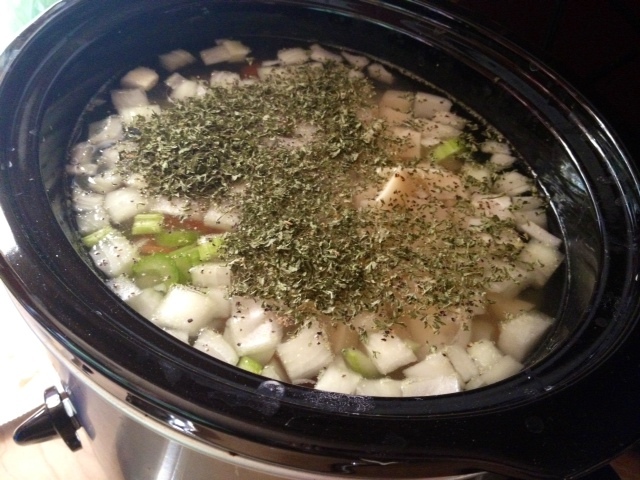 Add all the vegetables to the crockpot, along with the parsley, salt, and pepper. Stir everything together and put the lid on. Let it cook—for 3-4 hours on high, or on low for 5+ hours. If you’re around, stir every so often. If not, it’s no big deal. About an hour before you want to serve it, add the evaporated milk and stir. Then, about 10-15 minutes before you want to serve, mix up a little thickener with the cornstarch and some water and add to the soup (stirring to thicken). Now, if you’re serious about being awesome (and you should be), you’ll want to cook up some bacon. 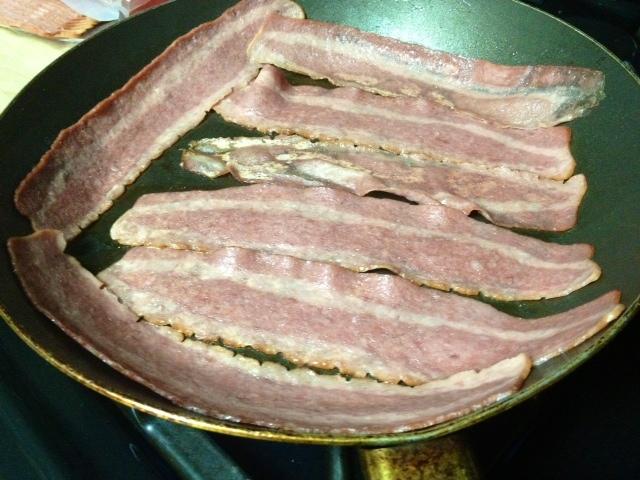 This here’s some delicious turkey bacon. 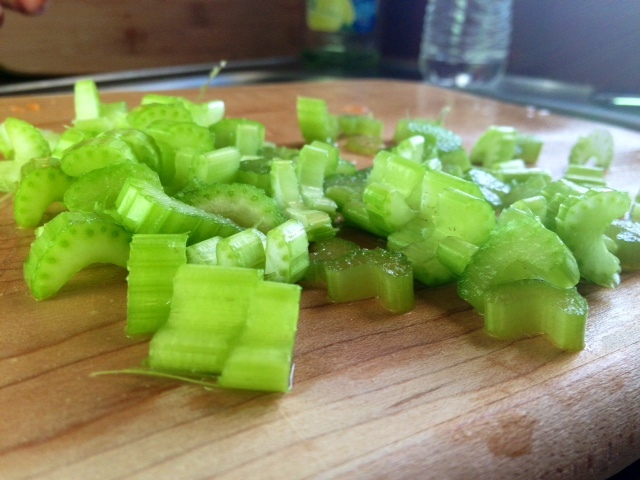 Crumble that bad boy up, add some shredded cheese to your now-thickened soup, and devour! Obvs have to try this ASAP. I understood this to be dang soup. 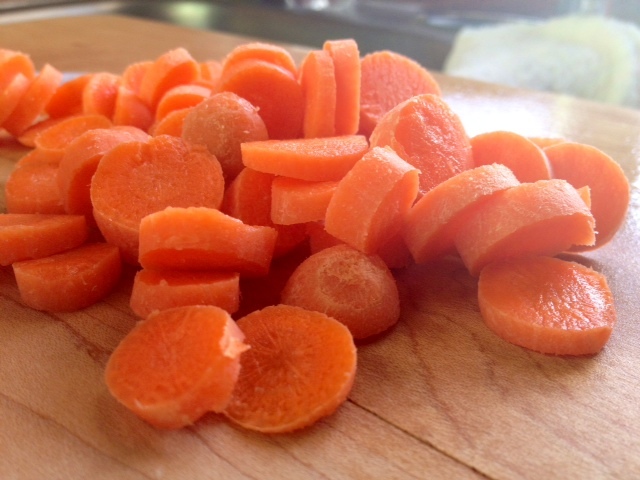 I don’t any dangs, fresh or frozen, listed in the recipe. Hehe, knew I forgot something! Could you put 2 cups of milk and just 3 cups of water to make it even creamier? Or do you believe that wouldn’t make a difference? Thanks. Could you put in 2 cups of milk and just 3 cups of water to make it thicker? Or do you believe that wouldn’t make a difference? Thanks. You definitely could–not sure it would make it thicker, but could possibly make it creamier (especially if you were using whole milk). The evaporated milk gives it the milk flavor, and since you add it at the end you don’t run the risk of accidentally scalding the milk or something. The cornstarch really does the thickening, so it doesn’t matter if you’re using water or milk in that case. If you try it, let me know how it goes! This is the same recipe that I have been making for years- only I use half and half instead of the evaporated milk. Love this recipe because it is so easy and can be made larger just by adding a “little” more of each ingredient. Just made this tonite, it was excellent!! Thank you for sharing! I’ve tried this twice and both times the potatoes turned out hard. Last time, we ended up transferring the whole thing to a pot and boiling it so the potatoes could finish. This time, I tried cutting the potatoes in even smaller chunks but they are still hard. Any other tips? What am I doing wrong? Hey Ashley! That’s so weird, I’ve never heard of that happening. How long were you cooking it in your crockpot and how high was the heat? I’ve done it in my crockpot in anywhere from 3 hours on high to many hours on low but never had an issue with the potatoes being underdone. Were the other veggies also hard, or just the potatoes? I’m checking with my mom (it’s her recipe originally) to see if she has other ideas on what the issue might be. I talked to my mom and her thought was maybe that it wasn’t cooked long enough. She always starts hers by 8 a.m. if wanting to serve it by 5 p.m. She puts the crock pot on high for the first hour or two, or at least until it’s boiling with everything in it, then turns it to low for the rest of the time. But her (and my) crock pot lightly boils on low (which is pretty strong), so that may be why neither of us had the potatoes turn out hard. Last time is made it I cooked it the entire time on high for about four or five hours, then turned it to low when I added the milk. I’d say cook longer, or at least longer on high. Let me know how it works! Cooking this right now! It is about 15 minutes away from being done! It smells so yummy, the potatoes are perfectly done and it’s thickening up just like it is supposed to! I hope it tastes as good as it smells! Oh man, that sounds so good right now! (weeks of working late, would kill for a real meal right now) Let me know how it turns out! I never use water in any recipe always broth. I love a richer flavor. Broth definitely adds an extra flavor explosion! I get cheap sometimes (or don’t have enough on hand) so will use water, but I actually have stopped using bouillon whenever possible from a health standpoint. I’ve updated the recipe to reflect, because I think that’s the healthier option anyway. Thanks so much for hte feedback! 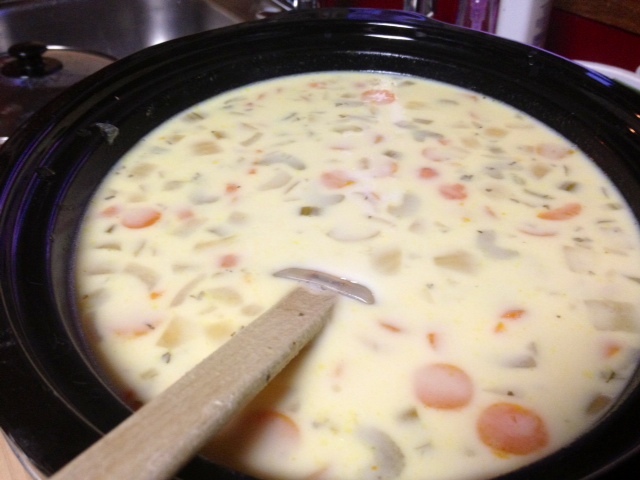 Can you use cream of chicken soup in stead of evaporated milk? It could work, thought I think you’d probably want to decrease the amount of bouillon you use to balance out the chicken-y-ness of it. It’s definitely worth a try—let me know how it turns out! On a related note, if the question is because you don’t have evaporated milk, you could also use either whole milk or half-and-half instead (just to give it some creaminess). Hi Sandra! I can’t say for certain because I’m not sure exactly how many servings are in the whole batch or how big of a serving people take. But I input the recipe into MyFitnessPal with exact ingredients and used a 10-serving amount as an estimate (feels right based on what my family eats), and it estimates about 250 calories per serving WITHOUT adding cheese and the turkey bacon as toppings (those are totally optional, so it’s up to the person). The soup itself is really very healthy–a lot of veggies, using either water or chicken broth (I like to use low sodium organic chicken broth), and then only the one can of evaporated milk. Hope this helps, let me know how it turns out! This is easy and delicious! 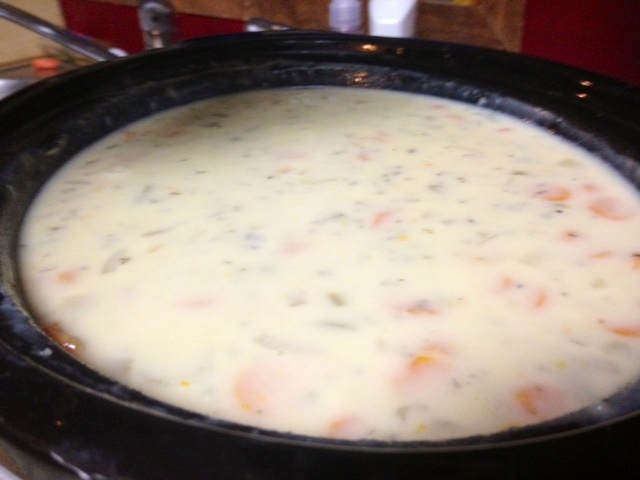 I put in the evaporated milk hour before serving but did NOT use the cornstarch as a thickener…instead, I just used my stick emulsifier right in the crock for a few minutes and the soup came out thick and creamy! Thanks for the recipe! That’s an awesome idea! 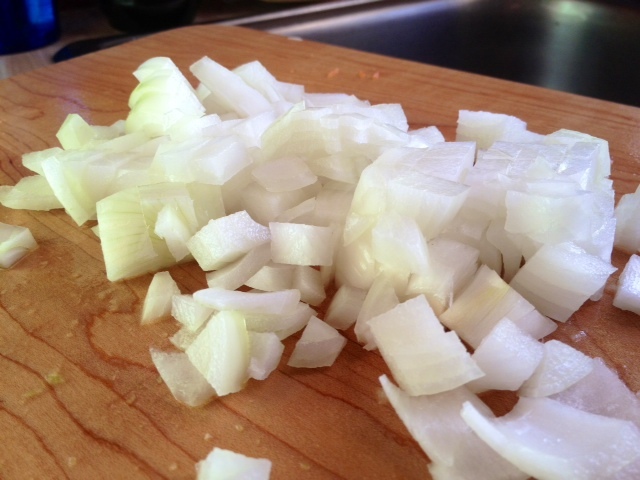 I love the chunks in the soup too, but you could blend some and keep some as well. Glad you enjoyed it! Looks yummy. 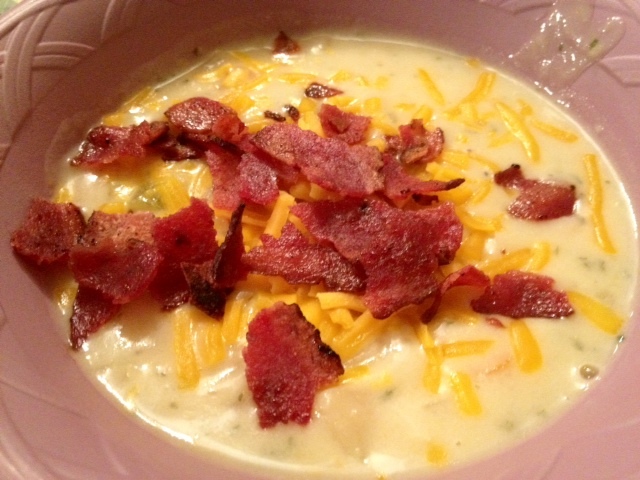 Have you tried instant potatoes to thicken soup instead of the corn starch? 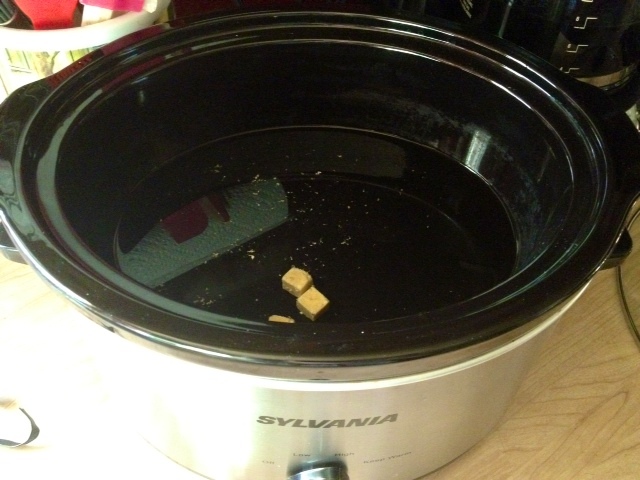 Thank you for posting the recipie using a slow cooker. Can’t wait to try it. I haven’t tried that, since it’s not something I keep on hand, but I don’t see why it shouldn’t work–if blending the potatoes up would, that should too. Let me know how it turns out! So bummed, followed the recipe exactly and it was the blandest soup ever. The recipe called for stock instead of broth, should I have used broth? Feel so bad, had it going all day and my husband took one bite and declared we were ordering pizza. Is there anything that can be done to save this? Hi Whitney! Oh no, that’s terrible…I’ve never had it be bland, it’s usually just the right amount of flavor without being too salty (though sometimes I add a little extra salt when using low-sodium broth). You know, I’m not sure on stock–I’ve always used stock and broth interchangeably (as words), but there may be a difference in flavor/seasoning there, I’d never thought about that. 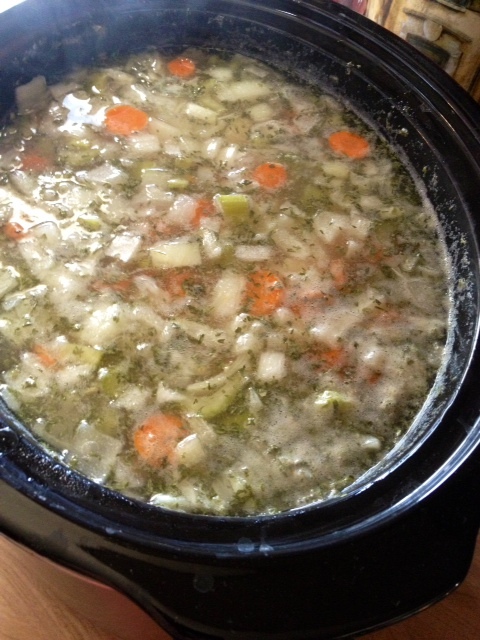 I use chicken broth from the store, just from cans of cartons, and just updated the recipe to make sure that’s clear. Did you use homemade stock? The vegetables themselves actually add a lot of flavor and I’ve never had a problem. I’m so sad it didn’t work for you, I’ll pick my mom’s mind to see if she has any additional thoughts. I’ll try again with the broth over the stock (the stock was store bought) and see if that changes the flavor. Thank you again for your response!